Featured image above: Car-free day in Paris 2018, image Guardian article, LINK. France is using the lure of hosting the Olympics to invest to triple the transport trips undertaken by bicycle across the country. 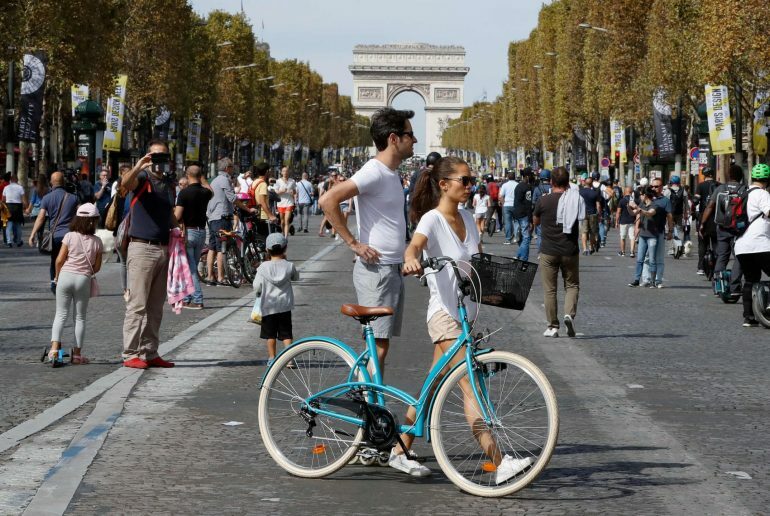 Citing France’s poor performance for active travel when compared to its European neighbours, Prime Minister Édouard Philippe said that although his country is host to the world-famous Tour de France cycle race, cycling here remains a sport rather than a form of transport. France will invest $AU569m (€350m) over the next seven years to raise the cycling share of transport to nine percent by the time it hosts the 2024 Olympics. Federal funding will be devoted to provision for local cycleways in recognition of the way bicycle infrastructure has traditionally been developed by local authorities and the resulting disjointed nature of bikeways that often stop at the local government boundary. “The discontinuity on the bike lane maps creates insecurity and discourages people from cycling,” the Prime Minister said. Another key aspect of the plan is to introduce cycling lessons in all secondary schools by 2022. France will also widen financial incentives for bike commuting. All civil servants will receive a €200 ($AU325) per year tax-free incentive for cycling to work, while private companies will have the option of paying their employees up to €400 tax-free per year. Investment in making to option to choose riding a bicycle for short trips is a world-wide movement, improving community liveability, contributing to ‘congestion-busting’ and improving another big killer, air quality. New Zealand has recently announced it’s own significant investment of $390m over the next three years to drive walking and cycling rates as part of its National Land Transport Program: LINK. These investments work – to improve incidental physical activity & health, improve road safety and make the choice to ride a bike for short trips more convenient and attractive, and we look forward to working with our colleagues across the nation to see a commitment to investing for active travel in the lead up to the imminent federal election.